I'm sure we've all established by now that it's autumn and with that comes a hella load of autumn blog posts... sorry autumn haters (as if there is any, right?). I've seen so many autumn goodies that I'm trying to avoid splurging on so I thought I'd share a couple of my faves here. Anyway, let's see how long that no spending lasts... spoiler alert, not very. 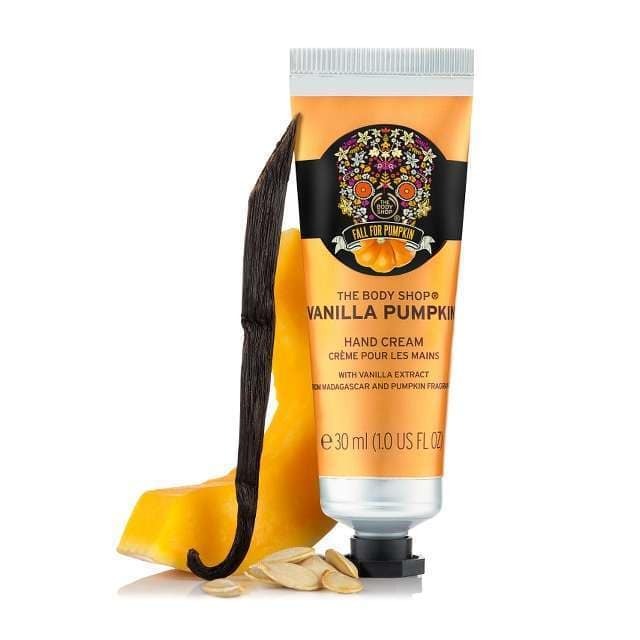 First off there's The Body Shop hand cream in vanilla pumpkin. I absolutely love the body shop handcreams they're non-greasy, they all smell amazing and they do hydrate really well (I have eczema and they're my go to). The packaging is usually quite cute anyway but oh my god can we talk about this 'day of the dead' inspired packaging or 'Dia de Los Muertos' if ya feeling fancy, it's just stunning. This scent was one of my favourites from last year it's just super cosy and comforting and if they had this in candle form I'd have brought 20 by now. Yankee candle's sweet orange spiced candle| Yankee | £8.99 here. Anyone who knows me knows that I have an unhealthy obsession for candles (if they really know me they'll know I have a separate storage basket under the best dedicated to unused candles). This one only a lil candle but as this is a wishlist lets just go all out and say I'd happily buy the large jar if I could. Can I just say, I absolutely love the new packaging on some of these candles, you've done a good job Yankee, it's literally so pretty. They describe this candle as "A gathering of harvest scents - cinnamon, clove, ginger and pumpkin - that's refreshing and warm".. someone actually takes my bank card off me, thanks. Tkmaxx White light up floral skull | TkMaxx | £9.99 currently £5 on offer here. Whenever I'm after homeware Tkmaxx is always my go too, I've seen so many beautifully decorated houses for autumn and I've been lusting over a few little bits for Halloween etc for the flat and to use in the backgrounds of pictures. I saw this really pretty skull in the store which I thought would look lovely on my book stand, it's very Dia de Los Muertos inspired again and I just bluddy love it and did I mention it lights up?. Red 'day of the dead' fruit bowl | TkMaxx | £5.99 currently £4 on offer here. Sticking with TkMaxx and the theme of 'Dia de Los Muertos' I found this adorable lil fruit bowl, it's bright and super pretty. I thought this would make the cutest trick or treat bowl, although as I live 3 stories up I don't really get trick or treaters (don't blame you all hate that many stairs on the best of days) It's also made of bamboo so it's gentle on the planet. Oh my gosh Tkmax, you've truly outdone yourself here, too faced lippies for under £10?, who even knew Tkmaxx sold make-up because I didn't and if you're a newbie to this one too go check it out because my gosh there's perfumes with lie £100 knocked off their retail price and you can pick up benefit, too faced and Becca goodies for a fraction of the RRP. Anyway enough of the fangirling, I thought these lippies would be really good for Halloween, they have a few colours such as 'Bye Felica' and 'Can't touch this' that I think would work perfectly with Halloween costumes. From my list, I'm sure we've all established that I'm never just going to be able to walk past TkMaxx without drooling over the make-up and that my spending ban has in fact already been broken whoops. What's on your Autumn Wishlist?.